This women's summer yukata is rich in centuries old symbolism. Shôkaku means "flying cranes" in Japanese. The crane represents the bird of happiness and a symbol of long life, good fortune and prosperity. 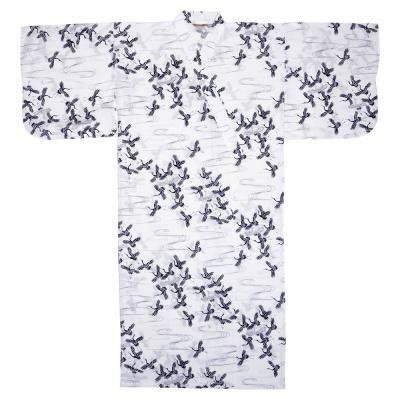 This white Japanese robe features flying cranes in rich navy blue, swirled on a crisp white background. The white yukata is destined to be a wardrobe favorite, and is produced in soft 100% cotton. Easy to care for; machine wash cold for best results. Summer kimono are popular during the warmer months. A matching belt is included with this white Japanese robe. This lightweight yukata is available in two sizes: Large and Large/Wide. Large, measures 58" in length and is designed to fit a woman 5' 7" to 5' 10"" in height. The sleeve length is 14", shoulder width is 25" and the girth is 48". Large/Wide, (+$6.00), measures 58" in length with a wider and much roomier fit. This navy yukata is designed to fit a full figured woman 5' 7" to 6' in height. The sleeve length is 14", shoulder width is 29" and the girth is 60". For shorter length robes, see our selection of happi coats. These are shorter length yukata and kimono. Our Premium Collection is designed and made in Japan. These beautiful robes feature high quality cotton fabrics and distinctive patterns. The artistic designs are inspired by traditional Oriental culture. FREE SHIPPING on orders of $75.00 or more, within the lower 48 states. Thank you for your rapid filling and shipping of my order. The Yukata arrived promptly and it was 100% satisfying. Thank you again.